Once again No. 20 Miami felt short by the slimmest of margins. The RedHawks lost by one for the second straight night, 3-2 at No. 14 Western Michigan on Saturday after dropping a one-goal decision the night before. Miami (9-9-4) fell to the .500 mark for the first time since the start of the season and are winless in their last eight, going 0-4-4. Matthias Samuelsson fired in the game winner from the high slot early in the third period after Western Michigan had taken two previous one-goal leads, only to have Miami answer both times. The RedHawks were without standout Josh Melnick for the second straight night, and regular starting goalie Ryan Larkin also did not play. RECAP: Western Michigan (13-6-1) won an offensive zone faceoff and Cole Gallant dropped a pass to Josh Passolt, who whipped it past Miami goalie Jordan Uhelski 2:12 into the game. The RedHawks tied it with 5:43 left in the opening frame when Ben Lown skated in on the right wing and centered a pass that hit a skate and caromed to Derek Daschke, who was wide open in the slot and slammed it home. With 6:51 left in the middle stanza, Colt Conrad fed Passolt on a 2-on-1 for a one-timer that put Western Michigan back on top, 2-1. Miami again pulled even when a 2-on-1 became a 2-on-0 as the Broncos’ lone defender, Cam Lee, blew a tire in his defensive zone. Jonathan Gruden took a pass from Brian Hawkinson and after his initial shot was denied, he poked it past goalie Trevor Gorsuch with 1:26 remaining in the second period. But Western Michigan regained the lead for good as a well-placed wrister by Samuelsson from between the faceoff circles beat Uhelski with 14:35 left in regulation. STATS: Passolt scored twice and finished the weekend 3-1-4 as he is almost certainly on his way to a weekly league award. — Lown ended the night with a team-best two points, both on assists for his first multi-helper game of the season and the second of his career. — Daschke scored for the fourth time this season, tying him with Grant Hutton for the team lead among defensemen, and Gruden’s goal was his second of the season, as he has four points in his last six games. — Opponents have scored against the RedHawks in 13 straight periods. — Both teams had three power plays but only 2:11 of time on the man-advantage. That’s because twice after Miami took penalties, WMU was whistled for a minor of its own within seconds. So it’s a rough 0-for-3 for both teams. THOUGHTS: Miami didn’t play badly at all, especially considering it was in a hostile arena against the hottest team in Division I, but once again the win didn’t come. WMU deserves a lot of credit for the weekend sweep, as the Broncos are flat-out impressive in every aspect, and it’s easy to see why they’re second in the NCHC. Western Michigan was ranked No. 14 coming into this weekend and was unbeaten in its previous eight. Make that 10 now and watch that ranking go up on Monday. 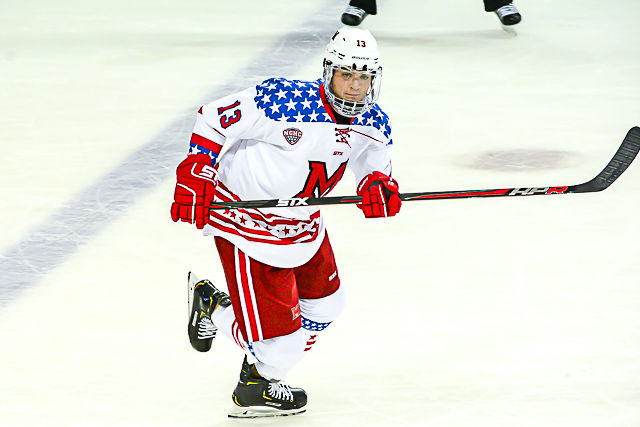 — Daschke’s line was impressive enough – one goal, six shots, three blocks, only Miami skater with a plus-rating – but he was a defensive menace to WMU all game, poking loose pucks away and getting his stick in the way of passes. Plays well beyond his 22 collegiate games. — Speaking of defensemen, River Rymsha was a standout in this game by laying out a couple of huge hits and playing great shut-down defense. Rymsha’s father, Andy Rymsha, was interviewed on CBS College Sports during Friday’s game. Andy Rymsha played for Western Michigan and logged six NHL games with the Quebec Nordiques. — Hutton has stepped his level up the past few games at both ends of the ice. He has four assists in his last four games and has played better in his own end as well. — Uhelski in net was a major surprise. 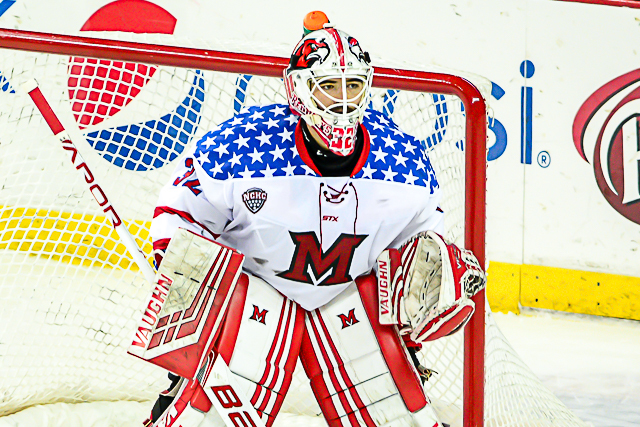 Was this a message to the team that it was too reliant on Larkin to make big saves, or are they pacing Larkin, who has already logged roughly 5,000 minutes as a RedHawk and been banged up several times during his Miami career? Uhelski made a phenomenal save on a breakaway and was solid overall. — Melnick remained out with a lower body injury. Hopefully it will not linger into the upcoming four-game homestand. — Win No. 10 has been a major hurdle for this program the past few seasons. Miami is 1-17-6 in its last 24 games chasing its 10th win. LINEUP CHANGES: Just Uhelski for Larkin. Uhelski stopped 30 of 33 shots. Coach Enrico Blasi likes to have his lineups pretty well set around this point of the season, and with the exception of Melnick and Larkin, this looks like the 20 he will head into the stretch run with. STANDINGS: Miami dropped to sixth in the conference at 3-5-2, leading just Omaha and Colorado College. The RedHawks slipped to No. 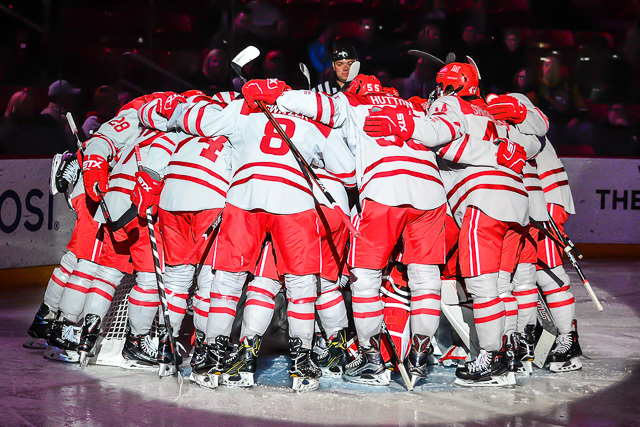 26 in the PairWise, which determines which teams earn at-large bids to the NCAA Tournament. Miami would need to climb to 14th or better to warrant consideration. FINAL THOUGHTS: Despite a lot of the positives surrounding the program, the winless streak is becoming unwieldy. The RedHawks are at .500 for the first time since opening night, which isn’t going to get them into the NCAA Tournament, regardless of how difficult their league schedule is. The effort is there, the passion is there, the process is there, and while those are all great things, the wins still need to be there at the end of the season or else this team will once again be done playing by St. Patrick’s Day. Especially considering the state of the Miami hockey program in mid-March, the first half of the 2018-19 season has to be considered a major success. 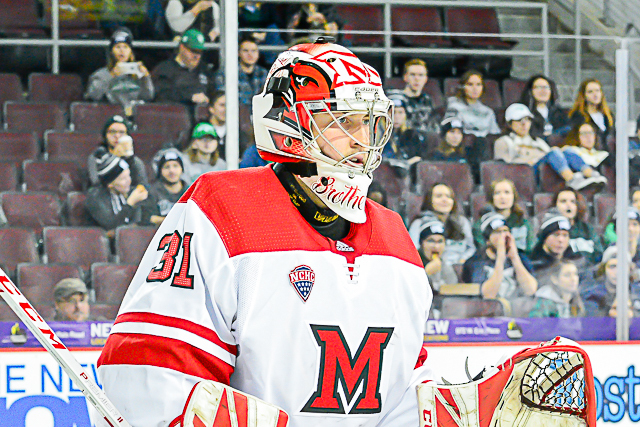 Following the RedHawks’ third straight first-round exit from the NCHC Tournament and subsequent dismissal of both assistant coaches, Miami received zero consideration as a preseason top 20 and was picked to finish last in its conference. But the No. 16 RedHawks have stuck it to critics, as they enter the back half of their regular season schedule three games over .500, their best pre-January mark in four years. The two coldest-weather months have been problematic for Miami in recent seasons, choc with top-10 in-conference matchups and long road trips. The RedHawks are 8-24-5 after New Year’s the past two seasons – a paltry .284 winning percentage – including 2-15-4 (.190) on the road. BoB takes a look at five things Miami needs to do to qualify for the NCAA Tournament. 1. Better special teams. The RedHawks are in the bottom half of the NCAA in both power play and penalty kills, with a 16.4 percent efficiency rate on the man advantage and a 79.4 percent PK clip. They have just four PPGs in their last eight games and are just 14 of 21 on penalty kills their last five contests (66.7 percent). Miami has tried pretty much every one of its skaters on the man-advantage and still needs to improve its chemistry. 2. Less time in the defensive zone. Teams have set up camp in Miami’s third of the ice at times and obviously it’s counterproductive to have your best players chasing the puck in their own zone for a minute or more. 3. Better road play. 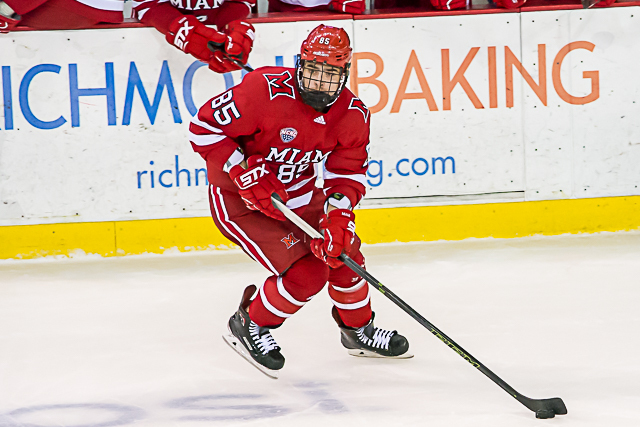 The RedHawks are a stellar 6-2-2 at Cady Arena but are 2-3-1 on opponents’ campuses and 1-1 on neutral ice. And with the exception of Providence, those road foes were not among college hockey’s elite – Colorado College, New Hampshire and Omaha plus Mercyhurst in its home city. Miami has scored just 18 goals in eight games away from Oxford. And we documented the RedHawks’ recent road struggles in the second half above. 4. Cut out the major penalties. The NCAA has made its point: The bar for five-and-a-game has dropped significantly, and three guys who are not cheap-shot artists in the least have all been booted from games this season. 5. Avoid major skids. Last season it was a 1-9-1 stretch. In 2016-17 Miami endured both 10- and 11-game winless streaks. An 0-6-1 span doomed 2015-16. Those types of streaks are season killers, so the RedHawks must have a thicker skin than in past seasons when facing adversity. 1. Effort. This team does not quit, and there’s no reason to believe it will during the stretch run of the regular season. That attribute was exemplified during Miami’s last series, a pair of ties vs. No. 1 St. Cloud State during which the RedHawks fell behind by one goal six times and rallied to even the score each time. Karch Bachman has been one of the leaders in this area, as he has parlayed his game-changing speed with a suburb compete level, resulting in him leading the team in goals with seven and generating multiple scoring chances almost every game. 2. Goaltending. Throw out last season’s numbers for Ryan Larkin. He was voted team MVP as a freshman and is even better in 2018-19, boasting a 1.89 goals-against average and .936 save percentage – which is five whole percent better than his sophomore year when he finished at .886. Part of the credit belongs to Jordan Uhelski, who has performed well when called upon and was a game saver in both ends of the St. Cloud State series. Uhelski has a .915 save percentage but as importantly the graduate senior has also helped push Larkin, who did not have a similar foil last season. 3. Freshmen are improving. Derek Daschke is clearly the freshman MVP of the first three months of the season, as he leads that class in points (3-9-12) and has been exceptional in his own end as well. And he continues to improve on seemingly a nightly basis. Scott Corbett is thriving in his grinding role while wielding a quality shot that has netted him three goals, and he stood out vs. SCSU. Same with Brian Hawkinson, who is 1-6-7 and has been a better forward than those stats indicate. Monte Graham is a faceoff stud and is starting to demonstrate skills in other areas. Big D-men Bray Crowder and Andrew Sinard also seem to be adapting to the college game. Jonathan Gruden (1-6-7) is raw but has tons of upside and could take off once the calendar flips. 4. A healthy Knies? 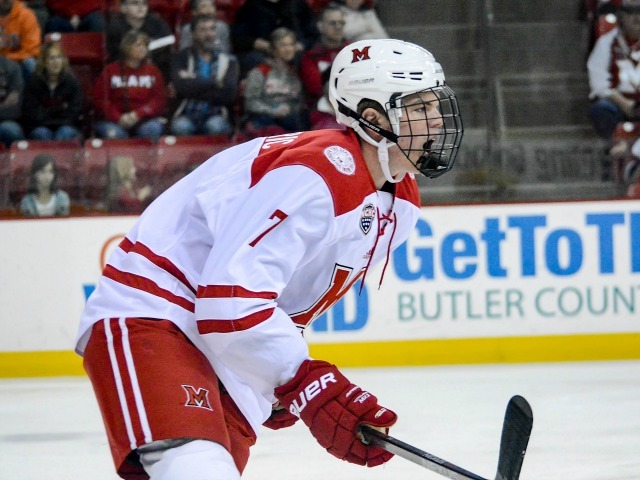 Phil Knies suffered an upper body injury at Cady Arena on Nov. 10, so Knies should be nearing a return. The sophomore will have missed seven weeks by the time the second half starts with the puck drop in Providence. Knies has been a critical part of Miami’s offense, scoring 11 times as a freshman and posting three goals in 12 games this season. 5. The defense corps is deeper. Daschke’s presence is huge, and River Rymsha has been a pleasant surprise, forcing himself onto the lineup card each night with his impressive two-way play. Crowder has dressed for all 18 games, and Sinard has seen the ice six of the last seven games. With sophomores Rourke Russell and Alec Mahalak earning regular spots, that has severely curtailed the number of starts for Chaz Switzer and Grant Frederic, who were decent five and six defensemen last season. Of course, standout and captain Grant Hutton leads this corps with a skill set that will likely land him in the NHL within two years. After a Sunday exhibition vs. the University of Guelph (Ont. ), Miami heads to No. 10 Providence. The RedHawks were already shut out by the Friars on neutral ice in October. Then it’s off the Kalamazoo to face No. 17 Western Michigan. Back home for a pair against Colorado College and two vs. No. 4 Minnesota-Duluth. Miami then heads to No. 1 St. Cloud State, followed by a home series vs. Omaha before its one off week of the second half. The final three series? At No. 8 Denver, at No. 4 UMD, home vs. No. 17 WMU. All eight teams have played eight out of 24 league games, or one-third of their conference slate, and Miami is currently tied with Denver for that all-important fourth spot. The four spot is crucial because it’s the final home-ice slot for the NCHC Tournament. Miami has not hosted a league tournament series since 2015 but has a legitimate shot this winter. Team GP W L T XP Pts. Miami played well overall the first half of 2018-19, better than many expected. The challenge of course is for the RedHawks to sustain that level of success during their annual murderer’s row of opponents in the winter months. But heading into the pressure cooker three games over .500 and playing with the type of intensity Miami has exuded the first three months, returning to the NCAAs is now a real possibility. OUT (3): Louie Belpedio (graduated), Scott Dornbrock (graduated), Bryce Hatten. IN (4): Derek Daschke, Andrew Sinard, Brayden Crowder, River Rymsha (graduate student). RETURNING (5): Sr. – Grant Hutton; Jrs. – Grant Frederic, Chaz Switzer; Sos. – Alec Mahalak, Rourke Russell. 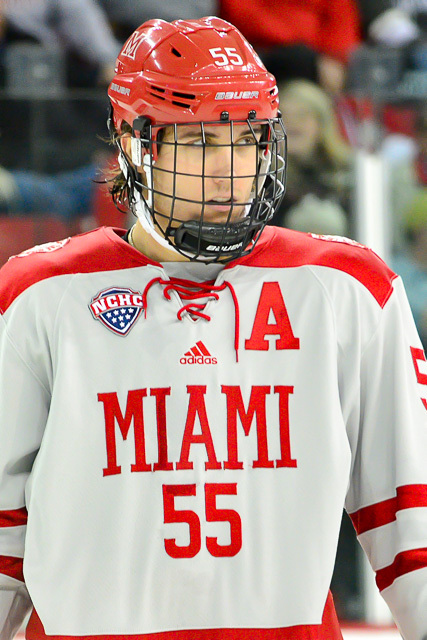 NOTES: Four of Miami’s starting six defensemen are back from last season, but the two who graduated were key contributors on the blue line. 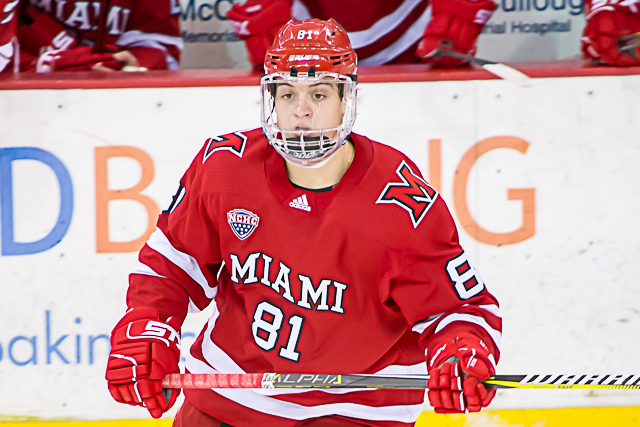 Louie Belpedio was team captain for two seasons and Scott Dornbrock logged 139 career games, but Miami adds four to its blueline corps and will have nine D-men to battle for six starting slots each night. All-planet senior Grant Hutton will share the captaincy with Melnick after leading college hockey in defenseman goals with 13 and tying for the Division I lead in power play goals by a blueliner (8). He has also been arguably the team’s best shutdown D-man the past three seasons. Alec Mahalak dressed for 36 of 37 games as a freshman and seemed to gain confidence in every facet as last season progressed, finishing 1-8-9. His size (5-feet-9, 165 pounds) worked against him defensively at times but he proved he can make smart plays, carry and pass the puck. Rourke Russell is a shutdown defenseman who was in the lineup 34 times his rookie season. He got tougher to play against later in the season, blocking 51 shots, and Chaz Switzer, who played 32 games, showed improvement in his second campaign with Miami and finished with 47 blocks. Miami’s Grant Frederic (photo by Cathy Lachmann/BoB). Grant Frederic only saw the ice 15 times but also seemed more confident in his second go-around, using his big body to defend more. If Frederic continues to make the case for a lineup spot as well as the four other returning blueliners, that would leave just one spot for four freshmen. And Derek Daschke is considered the defensive blue chipper of this incoming class. He has logged 232 USHL games in four seasons and went 8-21-29 in 2017-18. 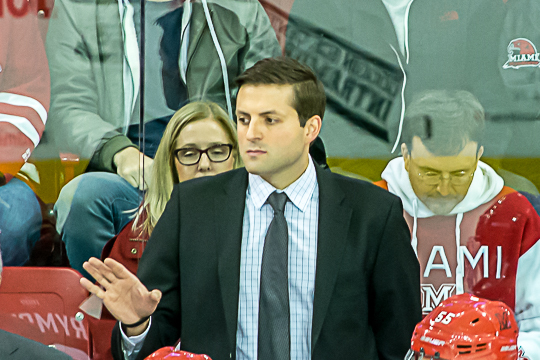 The 6-feet-2 blueliner played under associate head coach Peter Mannino in Chicago en route to a Clark Cup title two seasons ago. 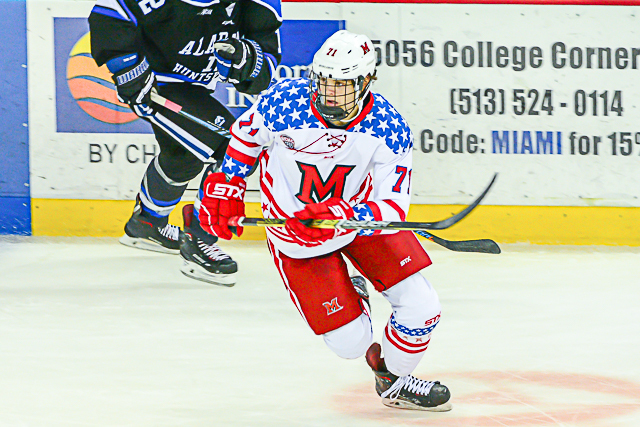 At 6-feet-6, Brayden Crowder will join Michael Findorff and Brian Sipotz among the tallest Miami D-men. 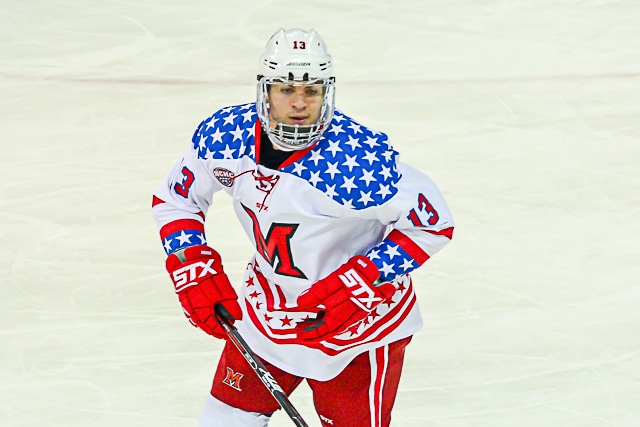 Andrew Sinard will also join that list of trees on the RedHawks’ blue line, as he is also 6-6 and listed at 185 pounds. He did not score a goal in 96 NAHL games but did pick up 21 assists in that span. 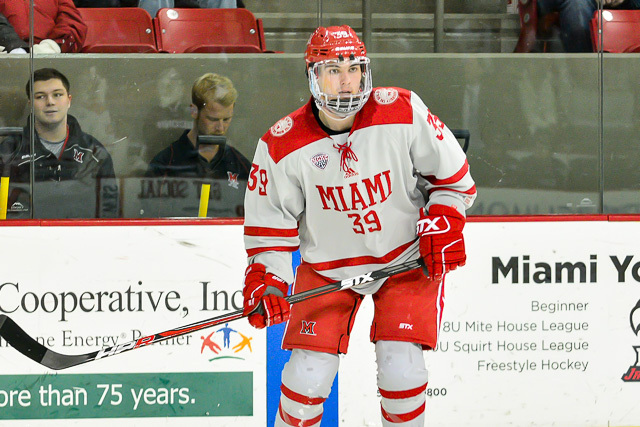 Dartmouth graduate River Rymsha joins Miami for his senior season. 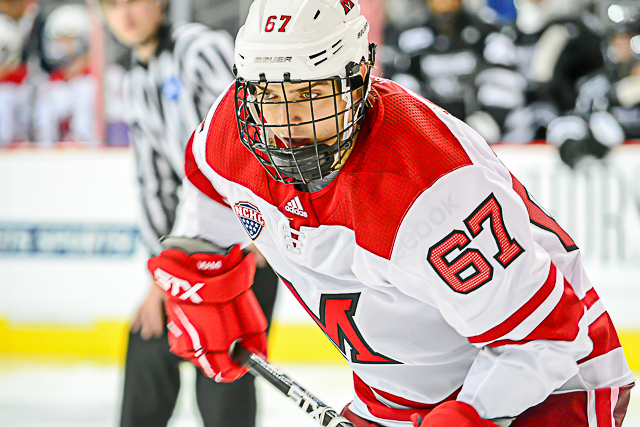 He is also a big body at 6-3, 205 pounds, and dressed for 28 games and picked up a goal and two helpers at that Ivy League institution last year. This corps helped Miami hold opponents to 27.2 shots per game in 2017-18, but too many were high quality. They also need to help tighten up a penalty kill unit that killed just 78.0 percent of its chances, ranking 46th in the NCAA.